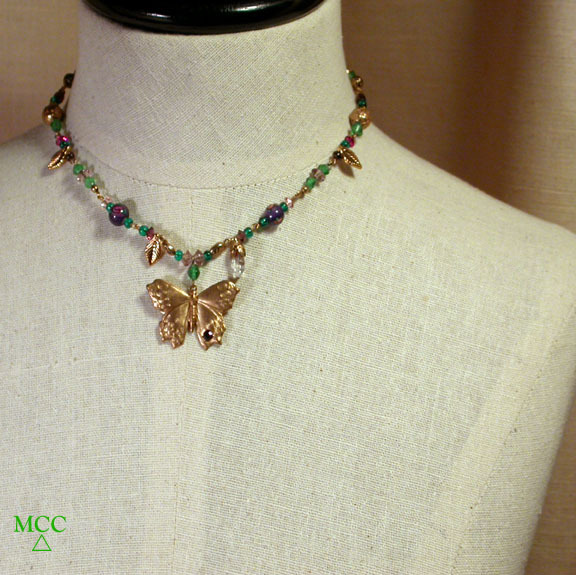 Beauty Spot is a rosary-link choker [16"] and has a 1-5/8" butterfly pendant sporting an amethyst Swarovski glass rhinestone beauty spot! We feature a shimmering, natural laser crystal along with lampworked lavender glass rose beads, Czech pressed-moulded emerald glass beads, Swarovski colored [glass] crystal facetted rondells in all the best colors. 14k goldfill findings and spring ring clasp. The jewel tones of this piece will have you wearing it year 'round! Sent gift boxed with handwritten description on the reverse of our enclosure card. Shipping will be added.